Recently I had a powerful experience where I was given an opportunity to grow and expand with a new company. I felt excitement to grow and learn new things as well as to share my wisdom and leadership with others. Everything felt exciting and I knew I was ready to try new things as my current job had become very robotic and predictable. So I took the leap and I trusted that I was on my way to new experiences and adventures. I felt a heartfelt passion to help others and to lead this organization with love, truth and awareness. I knew I was prepared and had what was needed to lead with alignment and inspiration. Life can be an interesting teacher and I have learned to trust the process and stay present with everything as it unfolds. Long story short I was at this new job for approximately one month and at first I was ignited by excitement and ready for the new. After about a week in I was shown many misalignments and it was my job and purpose for being brought in to observe and report back with my awareness and intuition. So I did my job, and did it well. The man I was hired to assist and train with was very excited with all the things I was seeing and sharing, for the confirmation. He seemed excited for the ideas I was brining to the table and told me to always share my ideas. I was excited because this is what I love is to truly be me and share from my own alignment and awareness. This was week one. Over the following weeks the balloon began to deflate quickly. As I stood back and observed not only the staff I was asked to observe, but also the leadership team. I started to really see some spaces for growth and shifting. I courageously shared my awareness with the man I was assigned to work with and truly wanted to assist him in finding a better balance with his life. Working with him for several weeks I was empathically feeling drained and tense and I knew this was not a good thing. After experiencing a very disrespectful phone call with this individual I felt sick to my stomach from the tension as we hung up. I knew I had to look inward for my own aligned direction, so I went home and went into a quiet meditation space to listen to my soul’s wisdom. After meditating I realized that this energy was affecting my wellbeing and that it was causing me to doubt my own gifts, to feel incapable and stressed. This was not okay with me; I knew things needed to shift as my alignment and wellbeing are my highest priority. So I thanked my angels for stripping away anything that was not for my highest wellbeing and for illuminating the highest aligned path of joy and goodness for my own soul in alignment with my soul’s mission. The angels did just that. I was called into a meeting to discuss the differences in our observations with this co-worker and I was given space to speak my truth. I stood up for myself and spoke the truth of what I had observed while being at this facility, especially concerning my co worker. I spoke of how I felt by his inconsistent and dominating energy and that from my awareness these behaviors were not only unnecessary but very damaging. My co-worker became defensive and expressed new insults and then boldly lied while looking into my eyes. My stomach felt like it was fired up from this lack of integrity and I knew at that moment this was not a place for my soul to thrive. I share this experience because life happens to all of us. Sometimes our plans work out beautifully and sometimes we are messengers for spirit sent to observe and then deliver messages without any attachment to the groups or environments we are called in to assist. I have often been the observer and the messenger and I have found that when souls are open and ready for evolution my awareness and observations are greatly appreciated. However when there are souls who wish to dominate and control others, and there is no desire for alignment, I know it is best for me to cut the ties and move on. As I trust and allow the messages to be listened to, acknowledged or tossed aside, I trust that what others do with their messages is not my responsibility. Sharing the truth is my responsibility. How many of you reading this have had times you went for something that didn’t work out the way you’d planned? How many of you stressed out when the job or relationship fell away? Did you feel unloved, or inadequate in some way? Did this change trigger fear, ego and worry in you? I ask these questions with the intention of bringing greater awareness, as well as a greater awareness of the fact that life is forever changing and shifting. One moment there is love and honor and we’re drawn in, another moment there may be fear and dishonor and we pull away. We are forever moving, bending, twisting and flowing into the great unknown that is life. When we understand this truth and we go with the flow, we allow ourselves to drop all that no longer serves our highest soul mission. This opens up new spaces for our souls to grow, evolve and expand. When we cling, we suffer and often cause suffering for others. However there is always another choice, the choice to let go and to flow. I love sharing my own soul’s journey with those who are open for greater truth and awareness as assisting others brings my own soul deep joy. So I share this experience with each of you as I consider each of you friends and soul family. It is my soul’s greatest desire to lead by aligned example and to ignite a passion for life in the souls of all that the angels summon into my sacred space. I have personally learned to feel everything energetically and to trust in what I feel and make choices from that inner wisdom. I have learned that thing’s change, as this is the way of the ever expanding universe. Life will continue to flow. We can either go with life’s flow and allow the waves of energy to lift us to where our soul is now ready to go, or we can try to control the flow and try to hold back the waves of energy, which leads to great suffering. I have learned to let go and flow. Every time I have lived in alignment and trusted life to deliver me to where I am now ready to flow, things evolve and I am shown great lessons and taught to trust. When I have clung to people, situations, titles and so on I have caused my own soul unnecessary suffering. So I challenge each of you to take a deep centering breath and tune inward and feel your own soul’s desires to expand and grow and to acknowledge your own soul’s desire for evolution. Just be still and listen. I promise you as you practice and allow time for inner stillness daily your soul will guide you to your own highest aligned path. Now the magic will happen when you listen to this voice within and trust that the entire universe is supporting your growth and wants you to thrive and succeed. Let me introduce you to my friend Trust. Living with trust is actually a very natural and simple option. It is actually our need to cling and stay stuck in fear and worry that is unnatural. Yet trust is always an option for each of us to align with. As we choose to trust, everything begins to open for us and life flows through us once more. As we take our thumbs off of the garden hose, we release the need to control the flow and we let go. Then infinite universal flow comes pouring forth, every time. Life then moves through us and lives through us. To summarize my own personal experience, I saw clearly that remaining in the energy field of this co-worker was causing me to feel sick and out of alignment. So I swiftly acknowledged this and I chose to let go, to speak truth, and allow the universe to take care of all the details for my life, as well as all those affected as I surrendered and went with the new flow of the universe. I must share that in that moment of decision to release this energy, I felt AWESOME! Now tomorrow is a new day, one that none of us really know what is coming. We think we know but it’s forever shifting. So because I understand this I will live fully aligned, aware and grateful for this day. I will give my love and light and live with a trust that these gifts are cherished and revered by many and that the universe is taking care of all the details for my life right now. I truly know that life will always take care of me. My angels constantly connect with me and share this and I love them and trust in the greater expansion and flow that my soul is ready to go with. Are you ready to live in trust? Are you ready to look inside and listen to the calling of your own soul? Are you ready to expand and flow into beautiful new spaces and evolve? 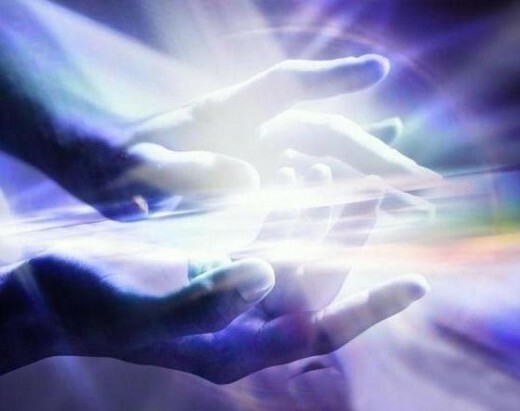 As an intuitive healer and light worker I have given my life to serve and assist others back into alignment with their own soul’s highest cherished mission. If you feel intuitively that I could be of service to you on this life’s journey, trust that your angels have guided you to me at this time for higher reasons. Tune in to our live internet show every Monday at 4:00 PM pacific time and ask me questions, share your testimonials and comments. Contact me as I have the gifts to serve any be it in person or remotely with powerful healing assistance as an intuitive healer and Soul Coach. So like Nike says…Just Do It! You are supported. You are loved. You are the guru you’ve been searching for!